Howdy! My name is Marshal Halloway, owner of CasCity.com and webmaster of CowboysTV.com. I reckon there's a reason for you being here. 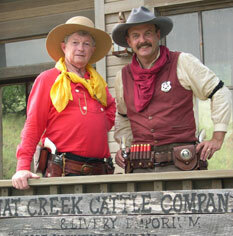 You may have heard of us, read about us in a gun magazine, watched an episode of Cowboys! on the Outdoor Channel or just happened to be at a shooting range and felt that you had just walked right into the 19th century. 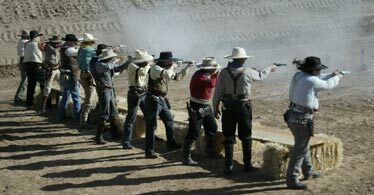 We call ourselves cowboy action shooters, western action shooters or mounted shooters. Whatever we call us, let me assure you; We Do Have Fun! This section of the CAS City website will give you some of all the answers you might be looking for. You will also find links to some good information both on other sections of this site and on other spreads on the Internet. One thing before we move on. The best advise I can give you is this: If you have a nearby shooting club involved in our sport, you do have the very best starting point of all. Make contact and come as you are. You will meet the most friendly people and they will stand in line to help you out. That is one of the trademarks of our sport. We are a family and we enjoy new members to our gatherings. In our reference guide, you may be able to find a local club affiliated to one of our shooting organization. In our forum, you will meet members from all of our organizations and shooters from all over the world who love the sport and are more than willing to help you out to get started. We are all proud of our online community and we are not favoring any organization within the sport. We just want to give you as much information you need to make the choice that is right for you. It is your job to find which organization that is the closest to your heart and to your personal preferences. Our job is to let you know which options you have. Ok, let's move on to more information. I will leave the rest of the information to one of my SASS pards, Capt. George Baylor (left below).